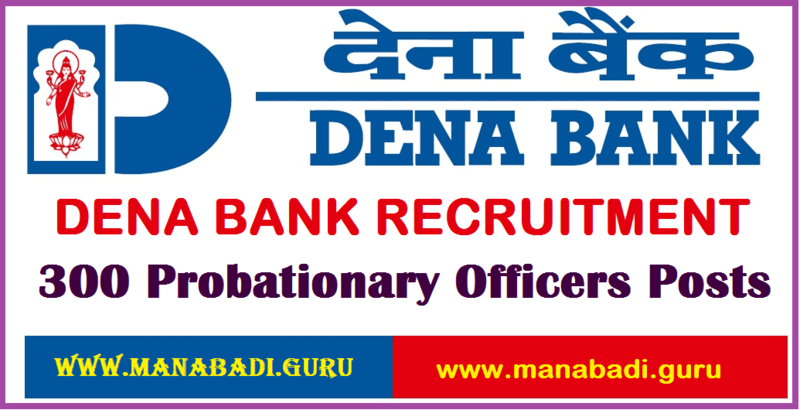 Dena Bank POs Recruitment 2017,Probationary Officers Recuitment,Dena Bank Recruitment for 300 Probationary Officers Posts,Dena Bank Recruitment 2017,Apply Online for 300 PO Posts. Dena Bank, Dena Corporate Centre, Mumbai has released notification for the recruitment of POs (Probationary Officer) in Junior Management Grade Scale-I for Post Graduate Certificate in Banking and Finance course.All Eligible and Interested candidates may apply online from 18-04-2017 to 09-05-2017.Dena Bank Pos Recruitment 2017 details like age limit, eligibility,educational qualification, selection process, application fee & how to apply are given below…. Age (As on 01/04/2017) Minimum 20 years- Maximum 29 years i.e. A candidate must have been born not earlier than 01/04/1988 and not later than 01/04/1998 (both dates inclusive).Age Relaxation Upper age limit as per govt rules. #Rs. 50/- for SC/ST/PWD candidates. The Dena Bank PO Recruitment selection process based on online exam followed by Group Discussions and Interviews. # Minimum qualifying marks in group discussion and interview is 40 % (35% in case of SC/ST/OBC and Physically Handicapped candidates. Through online mode. Candidates can apply online only from 18.04.2017 to 09.05.2017 through the link in the careers page of the Bank’s website www.denabank.co.in and no other mode of application will be accepted. #Last date for Online Registration: 09.05.2017. #Download of Call letter for Examination: After 30.05.2017. #Date of Examination (Tentative): 11.06.2017.